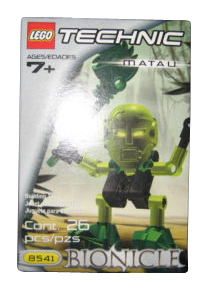 8541 Matau is a BIONICLE set released in 2001. It includes Turaga Matau, Turaga of Le-Wahi/Le-Metru. During the wars against the Brotherhood of Makuta, he, along with the other Turaga, was trapped for not cooperating with Helryx, leader of the Order of Mata Nui. The Turaga were imprisoned there when Makuta Teridax took over the Matoran Universe. The set includes the Kau Kau Staff (which has nothing to do with the mask called Kaukau), Matau's Badge of Office. A lever on his back can make him raise or lower his saw. This is the same set as 1418 Matau. Matau can be combined with Vakama, Nokama, Nuju, Whenua, and Onewa to form a Turaga-Nui. Ehrye wears the same mask as Matau. This page was last edited on 28 April 2016, at 17:56.